Automatic, dual counter rotating roll, sheeter and die cutter. 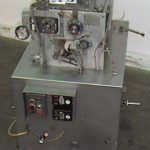 Equipped with two 8" diameter x 27 1/2" long rollers, manual gap adjustment, hinged rear roll design, rotary die brush, direct gear drive, differential speed cylindrical rolls, open frame design, pneumatically controlled mass containment saddles, on / off push button controls, and controls for wire and cutter. Mounted on stainless steel base. Currently set up with triangular diameter for 3" base x 3" high product.